One of the highlights of the first day of Build 2014 was the piano demonstration where Microsoft used an Intel-based solution to power a piano. 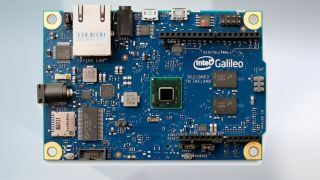 That solution used a Galileo board with a Quark chip onboard. What was even more spectacular was that it was running the Windows 8.1 Kernel, as demonstrated on stage by Microsoft's Terry Myerson. TechRadar Pro can reveal that this Quark chip was an X1000, a P3-class, 32-bit, x86 processor clocked at 400MHz. Getting a new operating system to run on such limited resources (we're talking of a CPU similar to a 15 year-old model) is a genuine feat, a real credit to the job done by Microsoft's engineers and developers. It costs less than $10, has a TDP of 2.2w, 16KB cache and is a full system-on-a-chip about the size of a pencil eraser (with 512KB embedded ECC-protected SRAM). In comparison, the Intel Celeron 400MHz had 128KB cache but a max TDP of 22W. Intel launched it in a bid to capture a slice of the Internet of Things market, which is essentially embedded solution and dominated by ARM and its partners. Joe Belfiore also announced that Windows for Internet of Things will be available for free. It is not known whether this will be a new SKU or whether Microsoft will use that term interchangeably with Windows Embedded (8 or Compact). Windows 8.1 update 1 is now out and available for download.